With quantum mechanical uncertainty and the chaotic unpredictability of complex systems, the world is now understood to have a certain freedom in its future development. (…) It is thus perfectly possible that God might influence the creation in subtle ways that are unrecognizable to scientific observation. In this way, modern science opens the door to divine action without the need for law breaking miracles. As I understand it, the author of the BioLogos piece has hypothesized a specific mechanism by which a supernatural agent could intervene in the natural world, in a manner consistent with our best understanding of the laws of physics. Specifically, the hypothesis is that a supernatural force can “override” the outcome of chosen quantum events. The author states that such actions would be unrecognizable by science as divine intervention. 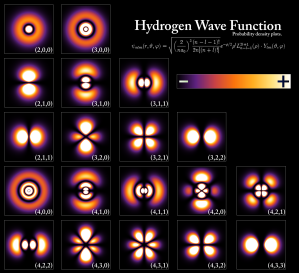 It is certainly the case that for a given single quantum event, once the wave function collapses into one of its possible states, there’s no way to scientifically determine a “reason” for why that particular state has resulted instead of another. The author implies that the accumulation of one or more supernatural quantum interventions can ultimately result in a change of some macroscopic events[*1]. But, due to the vast sea of quantum interactions that underlie everything in the world, we could never hope to learn about the divine force by starting from these macroscopic outcomes. This seemed at first to be just another gaps argument, where something unknown is assigned to divine agency, in other words a completely uninteresting (i.e. untestable, non-predictive, useless) hypothesis that can contribute nothing to our understanding of the world. But then I realized that I was committing the composition fallacy, as presumably was the author. While it’s true that we cannot make a prediction about which state a particular quantum event will collapse into, we can make very strong statements about which states are valid ones, and about the probability that each state will result. We can construct a particle emitter and measure a certain quantum characteristic of the particles as they hit a detector. We can accurately predict what distribution the resulting states will follow, and we can say that the order in which the states come out should look truly random. At face value this may seem irrelevant to the author’s hypothesis, but in fact it gives us the exact tools we need to build a god detector. Create a continuous stream of uniform quantum events that we can collapse and measure accurately. Attract the attention and influence of a god to alter the events in a directed fashion. Measure the accumulated distribution and randomness of the obtained states to see whether they have varied in a statistically significant way from expected values. Constructing the apparatus is obviously within our means, and should pose no problems as long as the machine is properly designed and controlled for systematic errors. Indeed in the event of a positive outcome, ruling out an undiscovered bias in the equipment (or experimenters) would be prudent before releasing findings. Apart from this, interpretation of results should be easy and unambiguous, and the experiment would be trivial to repeat as often as needed by different groups to verify the results. What methods should be used to attract divine intervention, e.g. focused group prayer, sacred objects or symbols near the equipment, sanctification of the particle emitter, construction by devout/holy individuals? While the experiment can obviously be repeated with different parameters in place, the number of permutations is effectively infinite. A manageable number of procedures could be agreed upon by consulting religious experts. Which deity or entity should be petitioned/invoked for the test? It would be reasonable to rank the gods by highest patronage and proceed in order. While it is not clear a priori that the number of people believing in a given god bears a relation to that god existing, this approach would most efficiently allow the greatest number of people to learn whether their god has interacted with the experiment. Power, i.e. how can we know that our target supernatural entity possesses the ability to influence our specific choice of quantum superstate, and that the entity is at liberty to operate in the time and place that the experiment is run? I submit that this is not a problem but rather a built-in efficiency. Although it means the experiment cannot detect any supernatural being incapable of participating, the entities of most interest are surely the ones held to be be omniscient and omnipotent[*2], which by definition will not have any such limitations. Hiding, i.e. how can we tell that a supernatural force would be willing to cooperate in such an experiment, rather than withholding its influence intentionally to frustrate the results? Many candidate deities are held to be willing to communicate with at least those people who sincerely believe in them. Therefore, as many believers as possible should be recruited to assist in contacting the god and requesting its intercession in the experiment. It is imperative that this be done in good faith and with full disclosure to the believers, to minimize the chance that their god would perceive the experiment to be insulting, derisive, or insincere, and therefore abstain from participation. Isolation and experimental integrity– the apparatus and indeed the experimenters themselves are confined to the temporal plane; in a very real sense the experiment is part of the medium it intends to study. There is no guarantee that the divine agency will refrain from interceding in harmful external ways, such as arranging the procession of events in the universe such that the experiment never takes place. For this we must rely upon the assumed earnest desire of the deity and the believers to establish contact, and the desire of the experimenters to properly test the phenomenon. The entity may repeatedly abstain from interaction with the experiment, or may elect to alter the states in such a way as to retain the apparent distribution and randomness of the results (for example by exactly reversing each individual particle’s state outcome from what would have naturally occurred). Several distinct supernatural agents may attempt to exert influence over the experiment at once but in mutually opposing ways, such that the overall signal is not distinguishable from negative results. If this experiment does not demonstrate a positive outcome, ideally a more rigorous test can be found that would be capable of falsification of the hypothesis. Footnote *1: The alternative would be that the supernatural actor operates randomly, capriciously, or to such an insignificant extent that no notable changes ever occur in our observable, macroscopic world. This would be tantamount to no intervention at all, and is therefore not an interesting case to pursue. Footnote *2: Taken to mean the supernatural actor is aware of all possible quantum superstates in the universe and able to manipulate any or all of them in the hypothesized manner.